It’s been a while since I’ve posted a recipe. Where have I been? Besides spending the last two weekends at “the shore”, I have started up a new diet. I re-joined weight watchers, and also saw a dietitian (John) who filled in a lot of the blanks that Weight Watchers leaves out. The basic jist of my new “lifestyle” diet. 1. Weight Watchers: I’m using the new point system that is a definite upgrade from when I did it two years ago. It now uses CARBS & FAT = more points and FIBER & PROTEIN = less points. I get to eat what I want but have to be aware of serving size. They also allow you to have almost 2 full days extra allowance for days you need some extra points or “splurging” days. You also gain extra points for workouts. 2. Tracking on WW: Since I already have the knowledge of what I should and shouldn’t be eating… the most important part of this all for me is the tracking. Being held accountable absolutely makes me eat better and be aware of everything going in my mouth. The new program for WW has an unbelievable Iphone/Ipad app that has made this all a breeze. You can even scan things right into your phone and their nutrition, point value, and serving size come right up. Cool. 3. Upgrade my eating schedule: The biggest problem John had with my current diet (besides my eating Fiber One “candy bars” he called them) is my eating schedule. He says that my body won’t burn calories until I have actual food in my body… not coffee. So I had been wasting 2-3 hours every day of time not burning calories. 4. Snacks are not Snack-Food: John’s thoughts on snacks are that they should consist of a protein and a fiber. He wants me to start thinking of “Snack” as a time to eat, not a type of food. I’ve been eating fat free Greek Yogurt w/ Allfruit spread or Fig Butter, Cottage Cheese w/ blueberries, Cucumber and Carrots w/ Laughing Cow or String Cheese… etc. So far, I’m loving the combination of the two! The weight watchers gives me direction when I want to eat and the motivation to keep track while John is helping me out with what’s really healthy and how to help my body make the changes I want to see. From now on, I’ll try to remember to include the WW Point Values on all of my recipes! With all of that being said, I’ve been busy food shopping for new foods and getting used to this new diet. This past week, I went to the movies and I didn’t want to be hungry, so I made myself a nice little batch of this delicious salsa to much on before I left. I ate it with Trader Joe’s Reduced Guilt Blue Corn Chips (which are so salty and delicious!). 1. Simple… combine all ingredients and stir, adding the Avocado in last to avoid mashing all of the pieces. 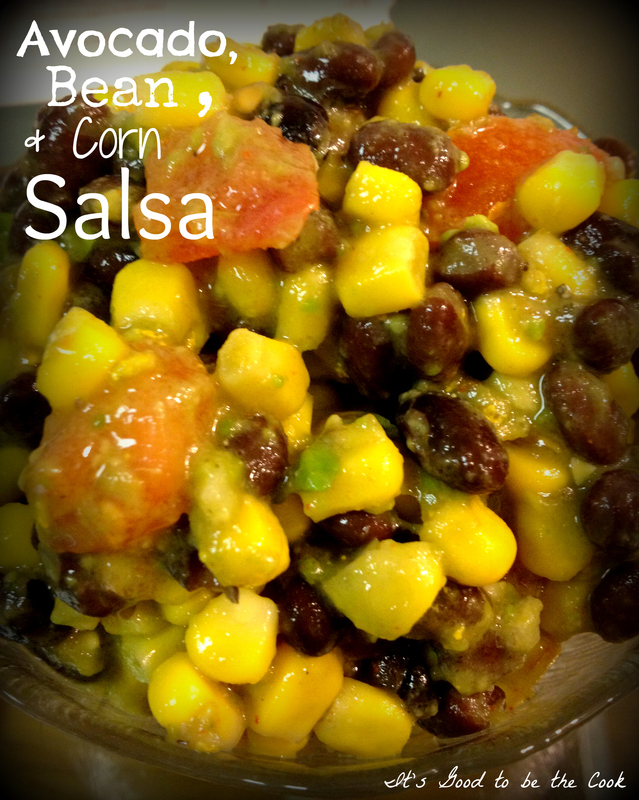 This recipe is similar to my Cinco de Mayo Corn Salsa (I really like corn salsa, could you tell?!) but has the beans and a few less ingredients. It is very easy to make but tastes very good! Yayyy! We can be each others support!! My sister is doing WW too. Maybe we could do weekly weigh ins together !? And not at meetings, I meant just us! Love that idea!!! And go Carrie! Just the picture of this salsa makes me hungry! Your eating schedule sounds like mine- coffee is an acceptable breakfast food, isn’t it? :-) I am trying to do better too actually. Not to lose weight, but to have more energy and just be a better role model for my girls. One of my favorite snacks is nuts- almonds actually. A handful of those gets me through cravings. I also like to start the day with a glass of ice water with either lemon or lime. I read that it kick starts your digestive system and helps flush toxins. For breakfast have you tried egg muffins? We love them! I like to make them early in the week so we have them on hand. ( I am going to post a recipe for them this week). It is! I love buying a bunch of cans when they go on sale (Corn, Black Beans, Kidney Beans, etc etc) and then just using them when I don’t feel like food shopping!